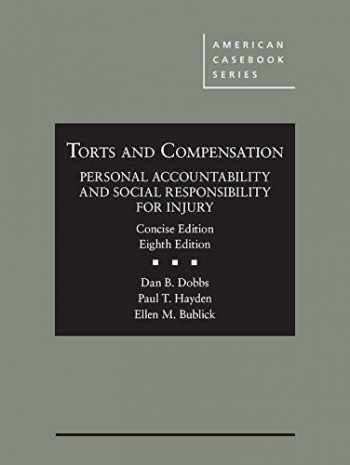 Acknowledged author Dan Dobbs wrote Torts and Compensation, Personal Accountability and Social Responsibility, Concise (American Casebook Series) comprising 763 pages back in 2017. Textbook and etextbook are published under ISBN 1634608186 and 9781634608183. Since then Torts and Compensation, Personal Accountability and Social Responsibility, Concise (American Casebook Series) textbook received total rating of 4 stars and was available to sell back to BooksRun online for the top buyback price of $55.77 or rent at the marketplace. This version is newly streamlined for professors who teach a four-unit course or who want to cover fewer pages per day yet retain complete coverage. This edition tracks the standard edition but pares chapters down to their essentials. It cuts an additional 300 pages of cases and notes, and occasionally trims cases to a shorter format. This edition also omits chapters concerning economic and dignitary torts, and some material concerning alternatives to tort law. The result is a substantially shorter casebook that nevertheless provides the coverage most teachers want.